Wednesday started bright and early simply because I was still on East Coast time. I woke up at 3:30 am and couldn’t get back to sleep. By 6:30 am, I was showered, dressed, packed, and at the front desk to get my room changed. I couldn’t get into a new room until the regular check in time of 3:00 pm, so I left my suitcases with the bell hop and went to breakfast in the Terrace Cafe on the hotel property. I forgot to mention this yesterday, but all the food I ate at the hotel was excellent. Since it was also expensive, I ate most of my meals at the mall which was behind the hotel property. 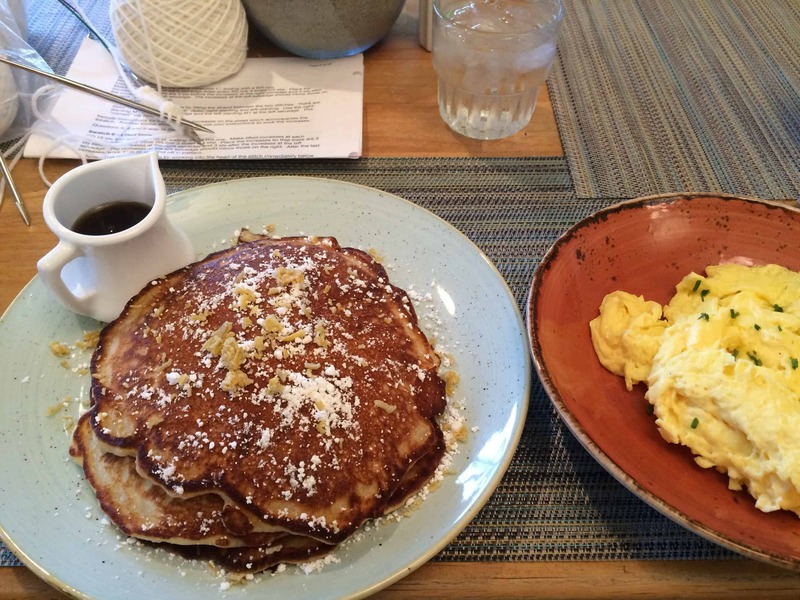 Lemon Ricotta Pancakes with orange maple syrup and a couple scrambled eggs. YUM! 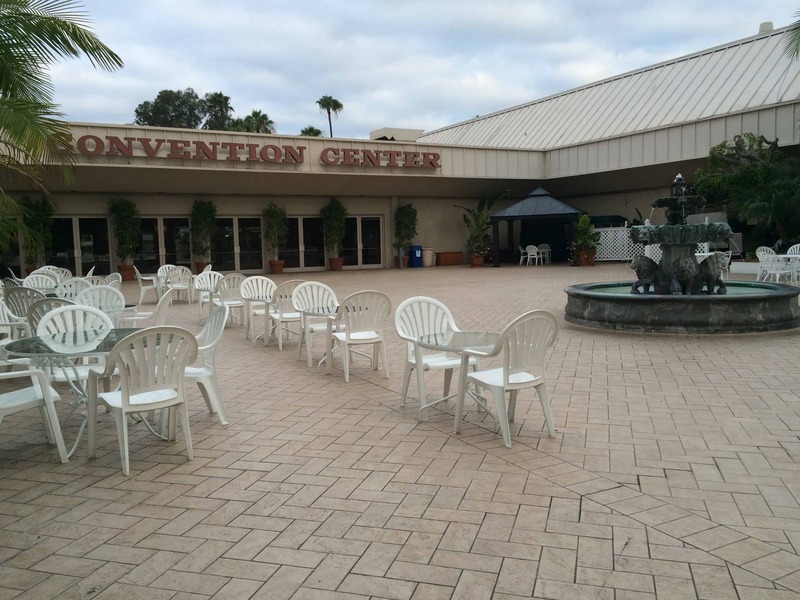 After breakfast, I headed over to the Conference Center. 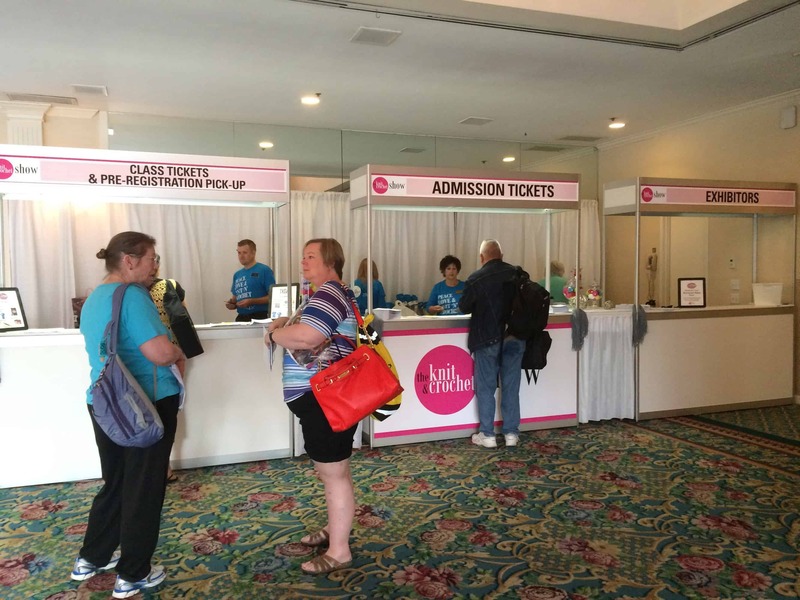 Since I received my registration packet in the mail a couple of weeks before the event, I already had my tickets, but I needed a sleeve to hold my name badge, so I stopped at the registration desk. 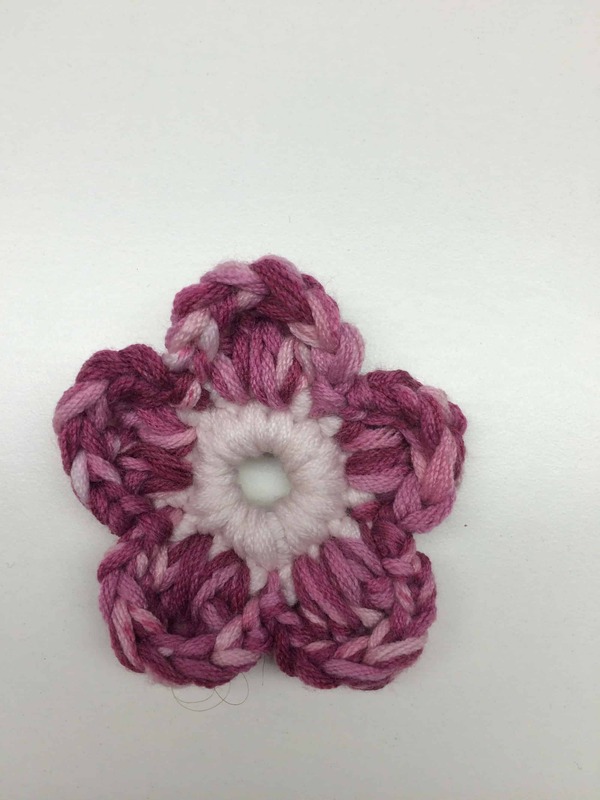 Kate crocheted a pink pin for each newbie and a blue pin for each buddy! I attached mine to my name tag. My second surprise was a goodie bag from Lion Yarns. The first 500 people to register for the conference got this goodie bag. 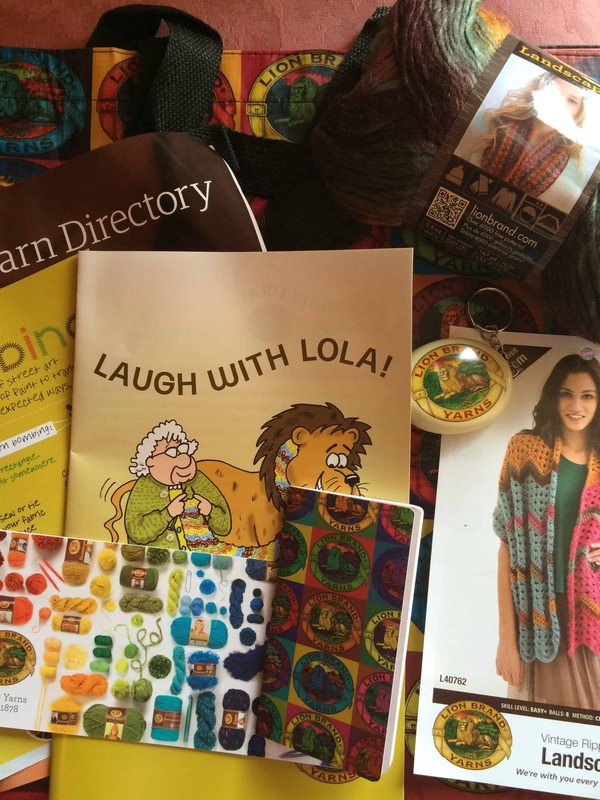 The small booklet on top of Laugh with Lola! is graph paper. I’ve never seen a graph paper booklet that small! The key chain is a tape measure. Here’s a better look at the yarn. 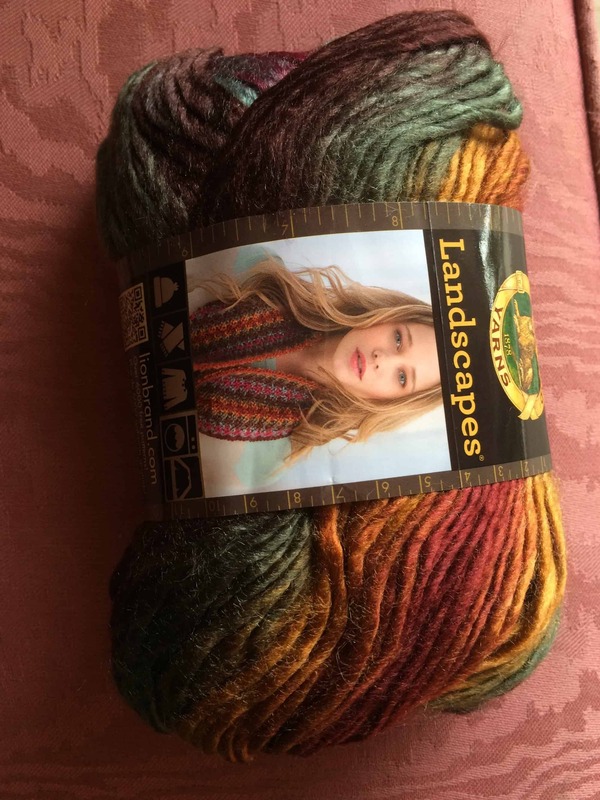 I hadn’t heard of this yarn before, and at first glance I thought it was wool (because of the texture) blended with silk or bamboo (because of the sheen). It’s actually acrylic! 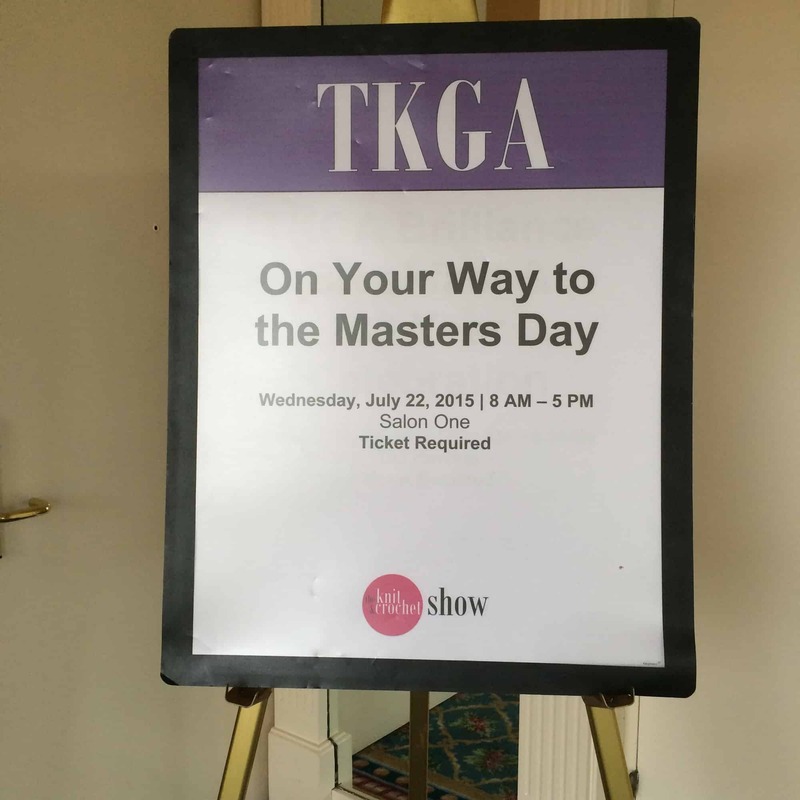 After registration, I headed to Masters Day! The three mornings sessions were vitally important to completion of Level 1, as these are the three skills underlying every single swatch. While each swatch does test other basic knitting stitches, if yarn selection, gauge, and tension are off, every single swatch will be off. I learned this lesson the hard way during the afternoon’s swatch review! 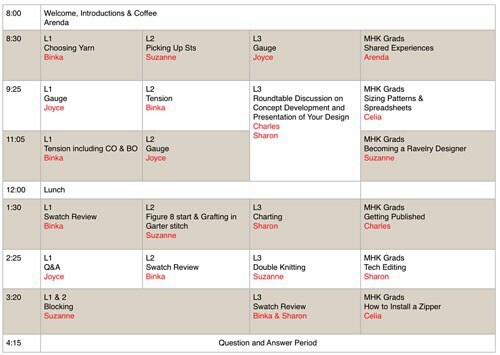 The information presented during the morning sessions is already available to everyone taking Level 1. 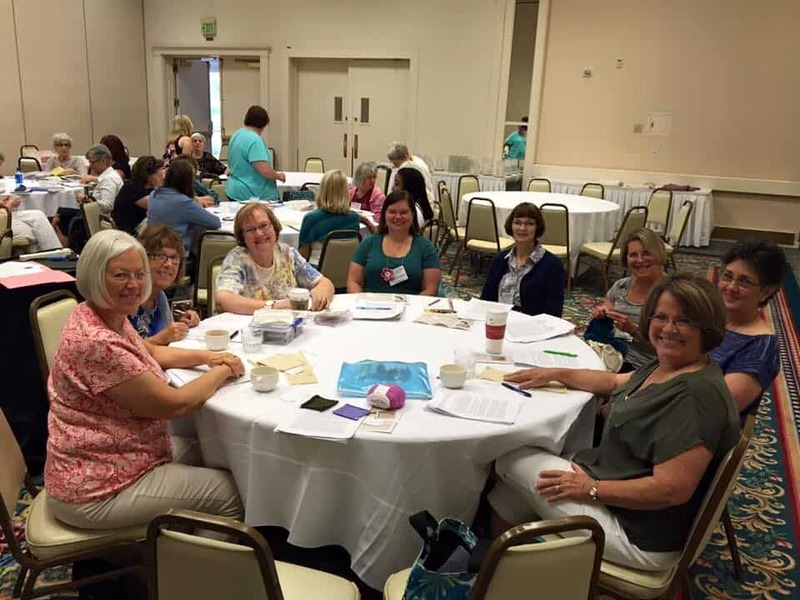 The general instructions, the On Your Way to the Masters articles in Cast On, the TKGA Ravelry group, and YouTube videos by several MHK Committee members cover the same topics in detail. I don’t know about you, but no matter how much research and writing I do (and I’ve done all of it for the first 15 swatches and the blocking report), I’m never 100% certain of my application of the technique. I’ve knit for a long time, but I’m self-taught, and I know the hazards that this can involve. No matter how much I think I understand, I don’t always do it right! The morning sessions were valuable because we got to see examples and ask questions. During yarn choice, we could hold up our yarn and say, “Is this light-colored?” Answer: While other colors might be acceptable, you can’t go wrong with white, cream, or pastels. The green yarn that I thought I might use for the mittens (the same yarn that I used for the swatches below) is too neon. It takes about 8 hours (all volunteer, by-the-way) to review a level 1 binder, and 20+ hours to review a level 2 binder. MHK requires light-colored yarn to make it easier for the reviewer to see the stitches during his / her detailed review of our work. During the gauge session, we walked through the steps of measuring gauge, using swatches provided to us. While I was working on my Level 1 swatches at home, I watched Arenda Holladay’s excellent videos on marking the swatches for gauge, measuring for gauge, and calculating gauge. During Masters Day, we used this same process with one important addition — we saw the process of placing the markers (in Arenda’s video, the markers are already in place). I found this demonstration to be particularly valuable on the cable swatch. Throughout Masters Day (and the 2-day Finishing Class I took on Thursday and Friday), I was repeatedly reminded of the importance of differentiating between a knit stitch (looks like a V) and the space between stitches (looks like an upside down V). While I’m generally skilled at reading my knitting, the first two times I placed the marker in the cable swatch, I put it in the wrong place. When you have a knit stitch next to a purl stitch, it is difficult to see the demarcation between stitches. I threaded the markers through the column of purl stitches beside the cable on the right and the border on the left. When you turn the swatch over, you see that each marker runs through the middle of a column of knit stitches. This swatch is correctly marked between stitches. On the back side, I did not split any stitches. On both the front and the back, the green yarn is barely visible! My biggest aha moment of Masters Day came during the tension session. I learned that I have tension issues. During the afternoon swatch review session, I realized that some of the problems I had with the swatches which I thought were execution problems were actually tension problems. Since these two sessions run together in my mind, I’m going to conflate them into one discussion on tension! During the tension presentation, we saw several examples of swatches with poor tension and with good tension. We saw gutters across the entire swatch and gutters only along the edge stitches. We also learned two techniques for diagnosing whether our purl stitches are larger than our knit stitches or vice versa. 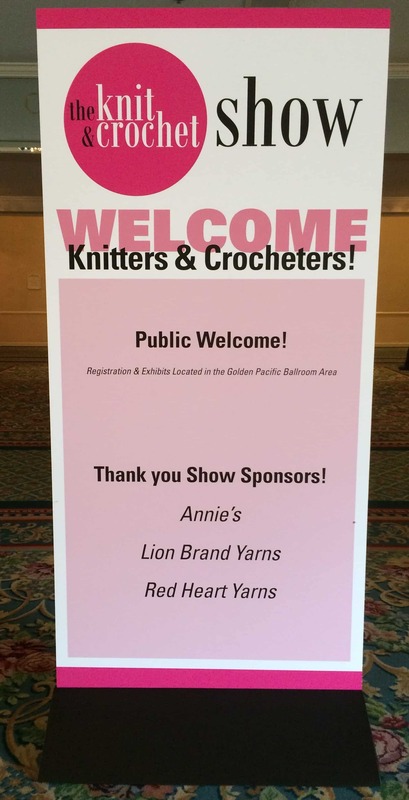 (For most people, the purl stitches are larger, but that isn’t true for everyone!) The first technique is to cut the yarn after a purl row and after a knit row, pull the rows out and measure the yarn. Suzanne Bryan, current Committee chair, wrote a step-by-step blog post on this method. The other technique is to knit a swatch with four rows of one color and four rows of a different color. 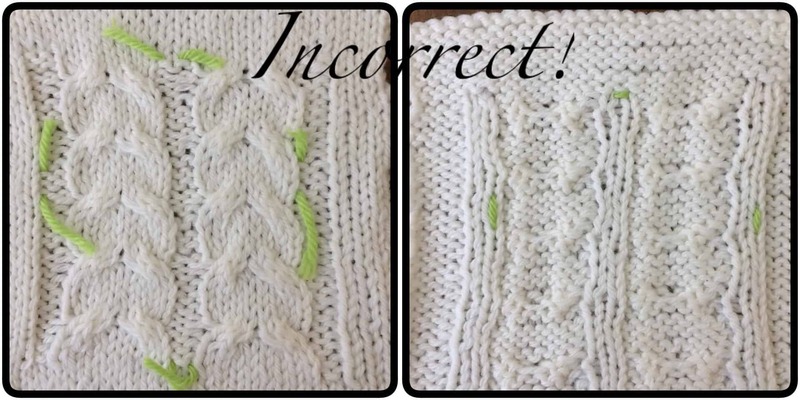 This method, detailed on knittsings blog, makes it easier for you to distinguish between purl rows and knit rows. I’ve knit for a long time. I did all the research for the swatches and learned the definition of guttering. I’ve read many posts on the TKGA boards re: struggles with tension and guttering. I looked at the back of my swatches, but since my guttering is not as pronounced as the examples I had seen, I didn’t recognize it. Here’s pictures of the back of two Level 1, Swatch #2 that I knit. The top row, on size 7 needles, is the one I brought to Masters Day. The bottom row, on size 8 needles, I rejected because I didn’t like the gauge. The guttering is more pronounced on it, so I’m including it here. The pictures on the right side are close-ups of the right edge of each swatch, where the guttering is more pronounced. For those lucky readers unfamiliar with the concept, guttering happens when your knit and purl stitches are not the same size. In reverse stockinette, two rows of purl bumps snuggle up to each other and on either side there’s a bit of space between the cozy rows and the next pair of purl bumps. As a result, the knitting looks striped. (The front also looks striped, but I think it’s easier to see on the purl side, so only included those pictures here). At least three Committee members looked at my knitting and offered suggestions on tension and guttering. My knit stitches are larger than my purl stitches. In addition, the guttering gets worse as I work across the row. Suggestions included trying a different yarn, going down another needle size, and taking a video of my knitting so I can see what I’m doing differently on my knit rows and purl rows. The Committee members tried to encourage me — it’s not the worst guttering problem they’ve seen and I don’t have to reknit all 15 swatches. I appreciated the kind words, but I’m actually not discouraged by the notion that I might have to reknit all the swatches! In fact, I was happy to learn that other things I thought were problems were a result of tension issues. 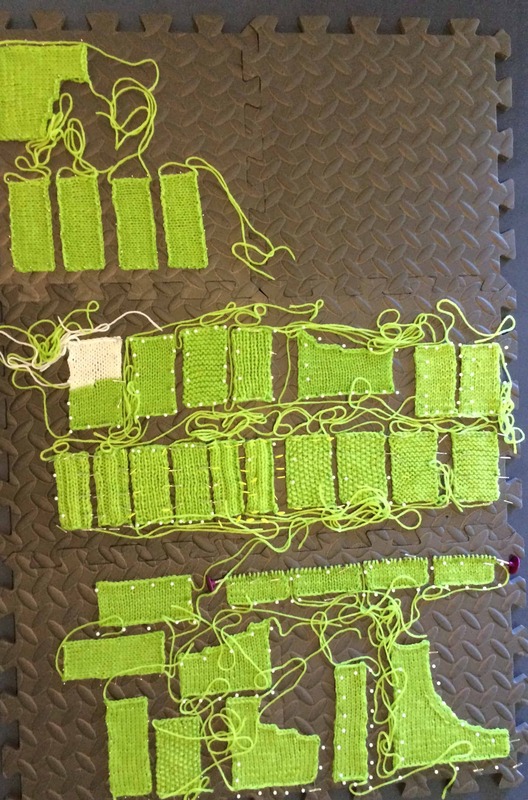 For example, here’s the picture of all the swatches pinned out for blocking. Notice how the increase and decrease swatches aren’t symmetrical. I thought I wasn’t executing the paired increases and decreases correctly. The increases and decreases on the left side of the swatch look more pronounced to me (the pencil points to the spot where I think this is easiest to see). While my increases and decreases aren’t perfect, my tension problems exacerbate the problem. 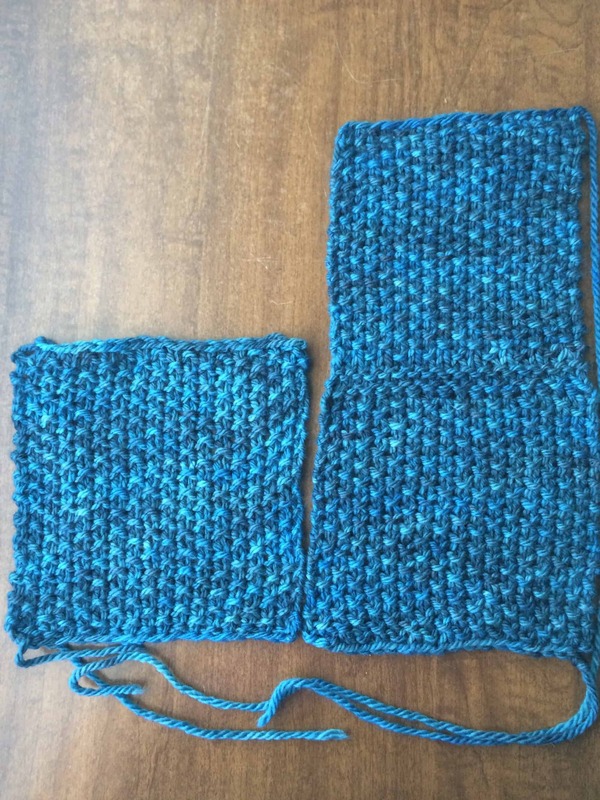 If I fix my tension, I will likely fix the symmetry of my increase and decrease swatches. 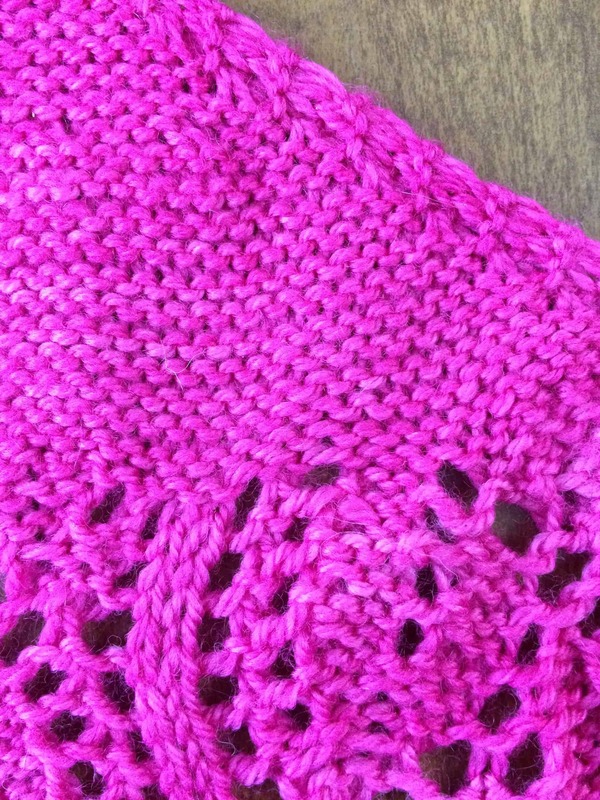 Remember last month when I mentioned that the Raindrops on Roses shawl is slightly asymmetrical? It’s probably just me. 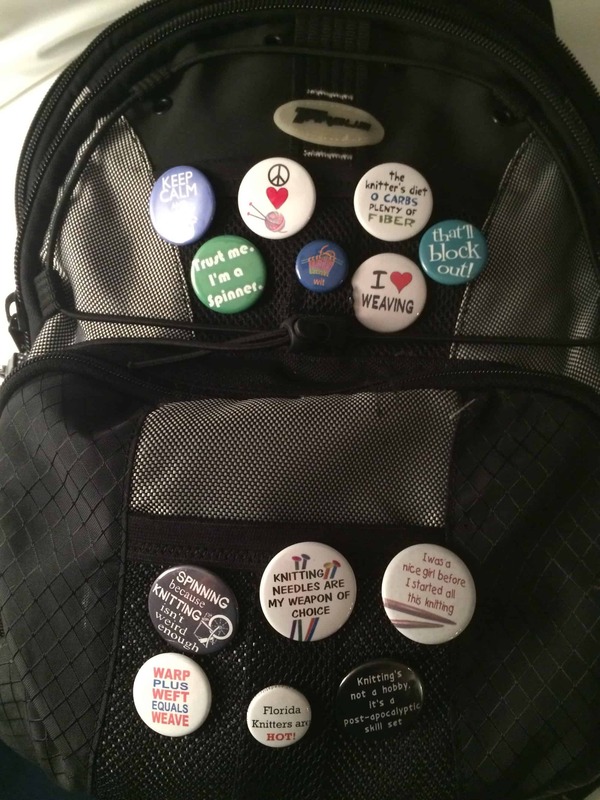 I had the shawl with me in San Diego, so when I got back to my room at the end of Masters Day, I looked at the back. 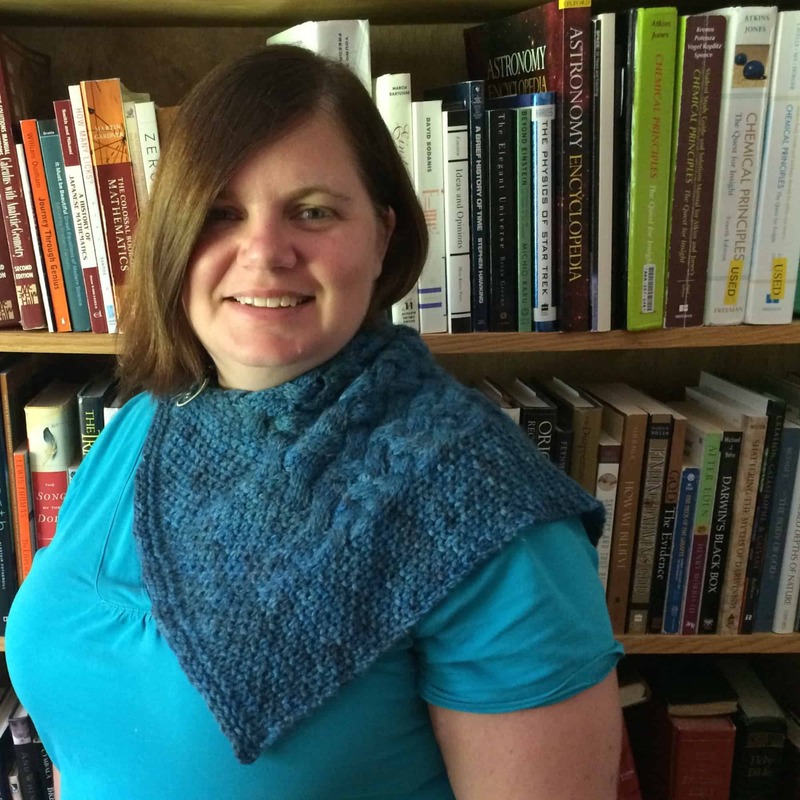 I have the same guttering problem on that shawl, and it is more pronounced on one side. 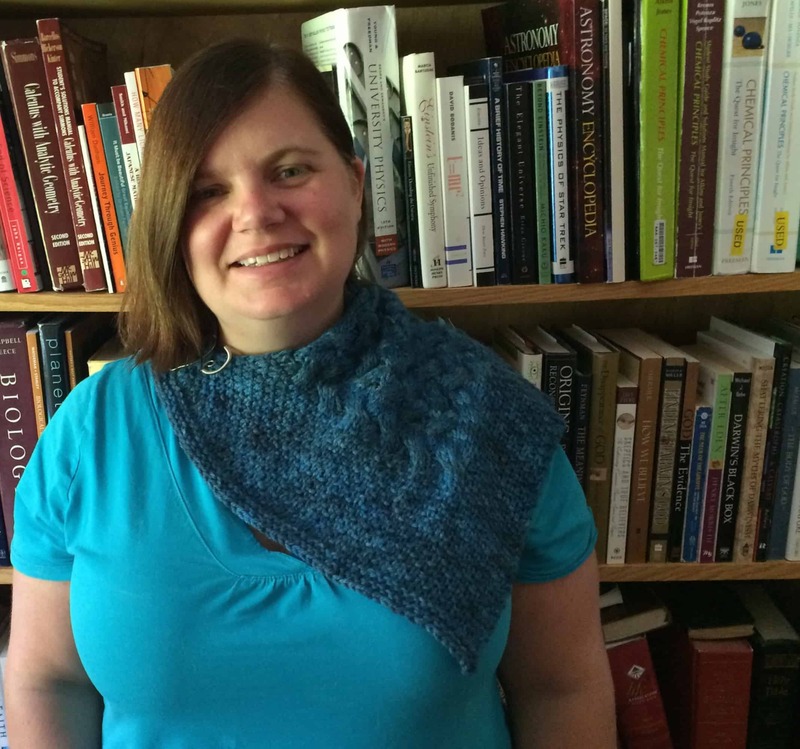 I also had with me an Icarus shawl that I knit 3 years ago. That shawl does not have the same guttering problem. These were important revelations for me, because it means the problem is not the yarn or needle size on my TKGA swatches. The problem is how I knit, and it’s a problem that developed in the last couple of years. I’ve been knitting more and knitting faster than I did before. I already knew my tension had changed substantially, thanks to the Liquid Silver Shawl, but I didn’t know that the increased speed and change in tension meant I developed gutters. 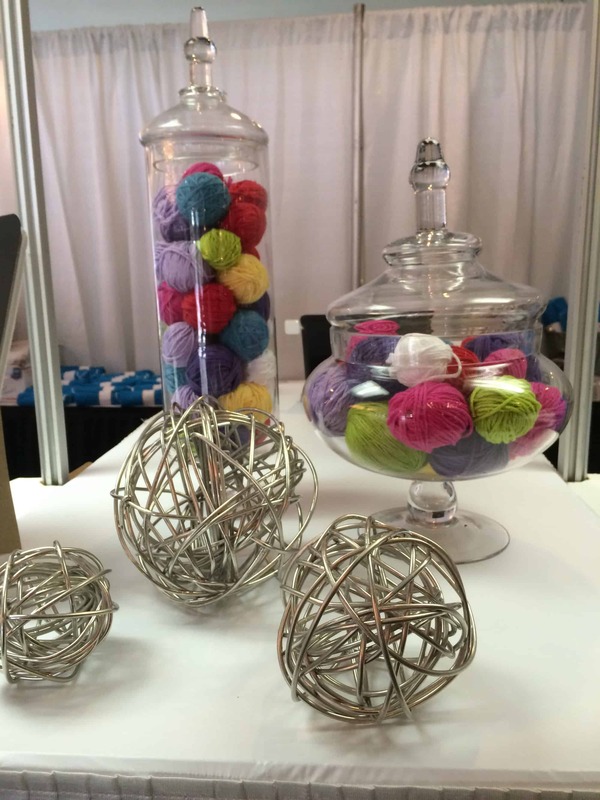 I immediately signed up for TKGA’s Taming Tension Course and Patty Lyons Improve Your Knitting: Alternative Methods (affiliate link) Craftsy Course. I signed up for the latter course because it covers several different ways to hold your needles while knitting. I’ll be working through both courses during August, trying to figure out my tension. I knit through my entire flight on the way home from San Diego, and I looked carefully at how I’m holding my needles. I’m pretty sure I know why my knit stitches are larger than my purl stitches. Later this week, I plan to record myself knitting so I can confirm my suspicions. I’ll share the results on my blog. Once I find a solution to my tension issue, I plan to reknit all the swatches. After swatch review, we had a blocking demonstration. My swatches pictured above are poorly blocked; you should ignore them. I was stretching out the swatches too much, attempting to correct the tension issues through blocking. That’s never going to work! Several attendees brought swatches with them and Suzanne showed us the proper technique. She put the swatches in a bowl of water and gently pressed them down, holding them in the water until air bubbles stopped rising to the surface. 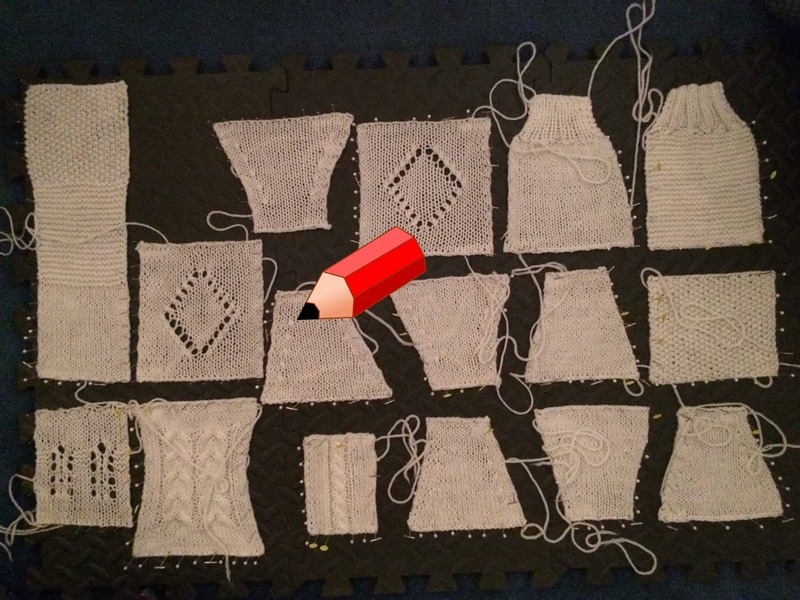 She then blocked several participant swatches, including swatch #15 (horseshoe cable) and #13 (yarnovers). In short, the proper method is to pin the bind off and cast on edges straight, without stretching the knitting. 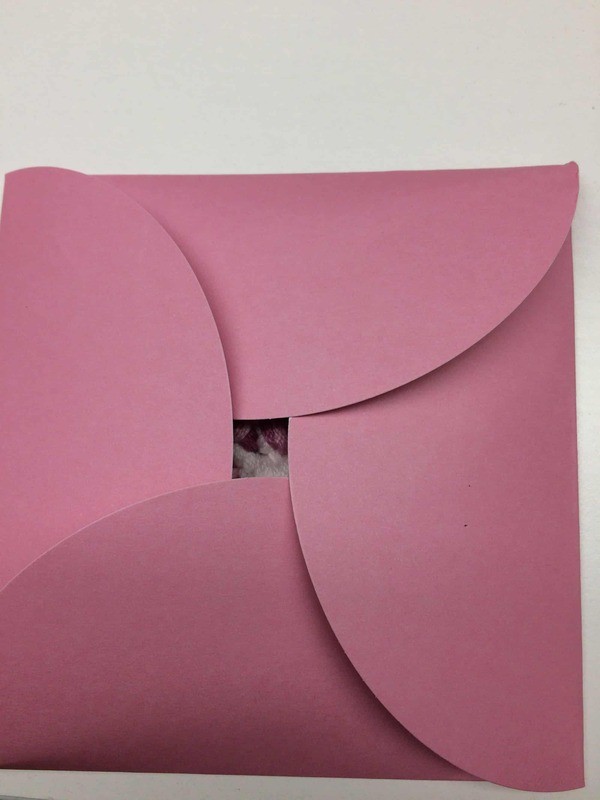 Then you gently unroll the edges and pin them down, again without stretching the edges. Of all my swatches above, the only one that I think is properly blocked is #15 (the swatch with two cables). 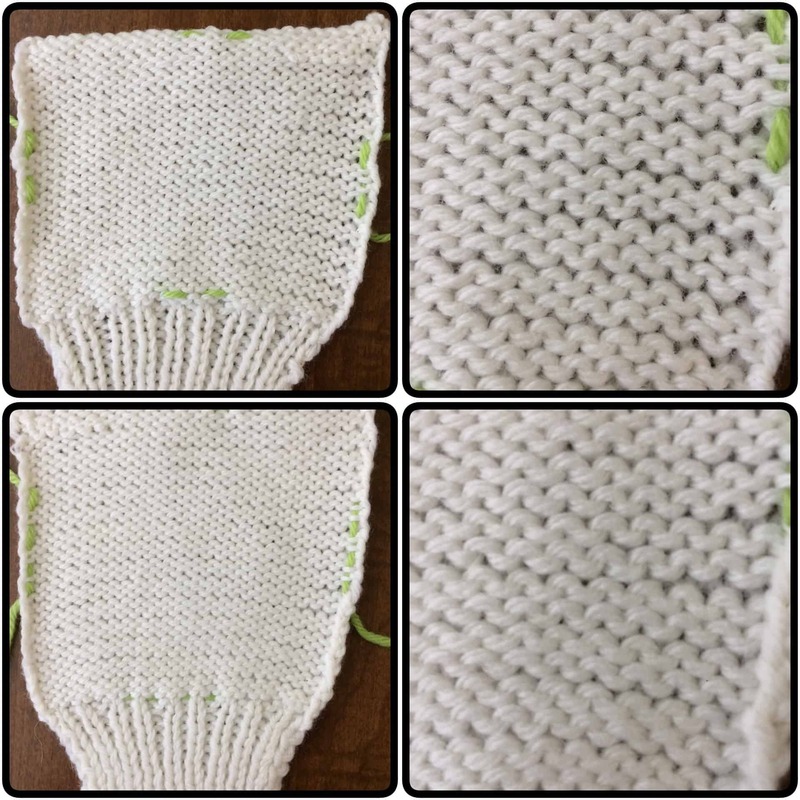 During the Q & A Session, Joyce demonstrated a method for working the cuff on the Level 1 mitten. I haven’t looked at the mitten yet, so recorded the demonstration for my reference. She kindly granted me permission to post the video publicly. 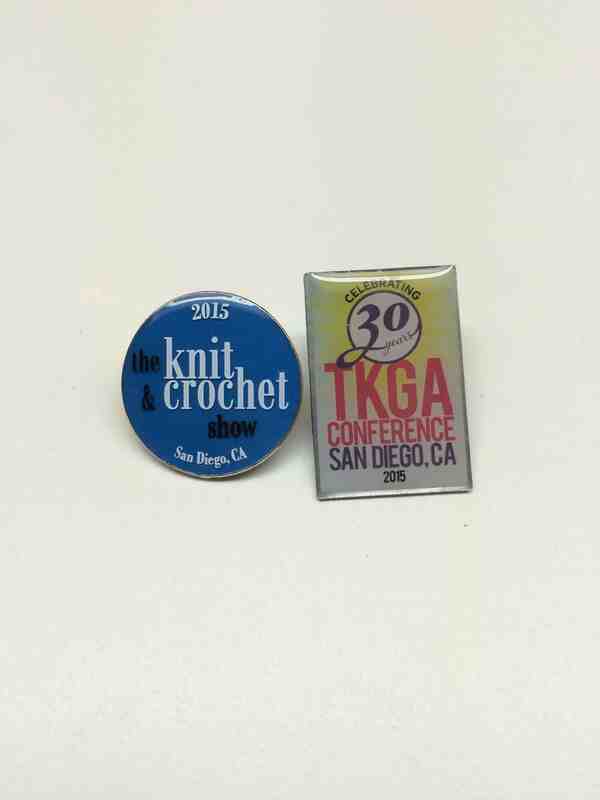 On one row of the cuff, you knit three, then k2tog. On the next row, you work a m1o increase, followed by k2tog. The k2tog on the preceding row tends to tighten the stitches, making it difficult to see the running thread that you need to pick up for the m1o. She showed us an easy way to get to the running thread. Most of the video demonstrates Continental knitting. 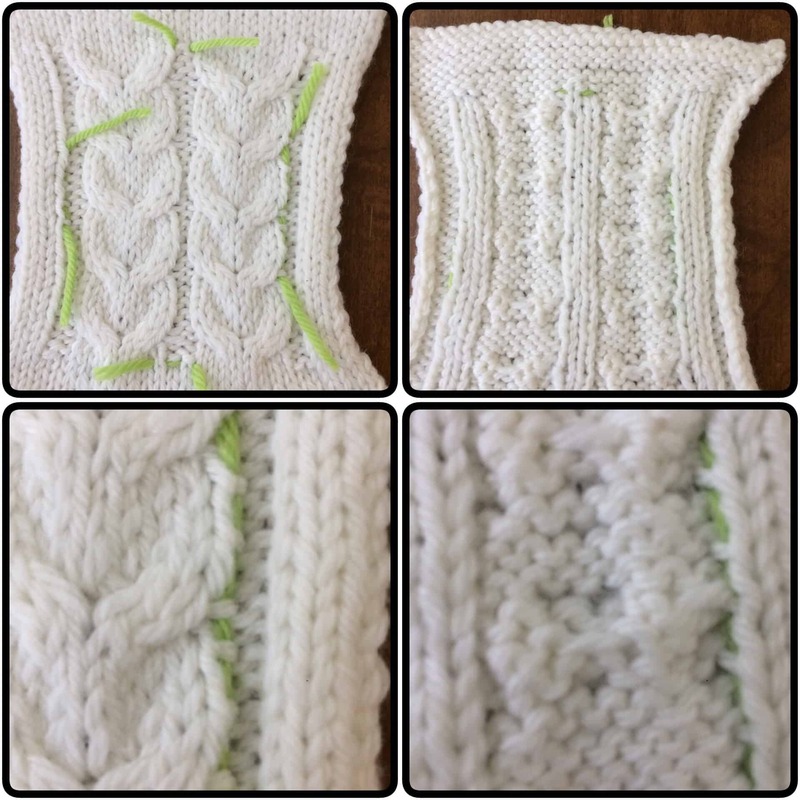 If you knit English style, like I do, skip to 2:50 for a method that works for you. I did not take any classes on Wednesday evening. After Masters Day, I picked up the key to my new room, dropped off my things and headed to the mall for dinner at True Food Kitchen. When I finished dinner, something happened that transformed my day and, I believe, the rest of my Conference experience. “He doesn’t want me to tell you who he is,” she replied before I even asked. Incredulous, I practically ran back to my hotel room and wept with gratitude (I’m tearing up again as I type this). I have no idea who this stranger was, but here’s a public thank you. Your random act of kindness blew all the negative crap out of my head. Because of you, I didn’t isolate myself during the rest of the conference, like I probably would have otherwise. Since I didn’t isolate myself, I met some new friends from across the country and the world. Thank you. A couple weeks ago, I wrote about making warp sticks from vinyl blinds. Last Friday, I tied on my first warp using the homemade warp sticks. 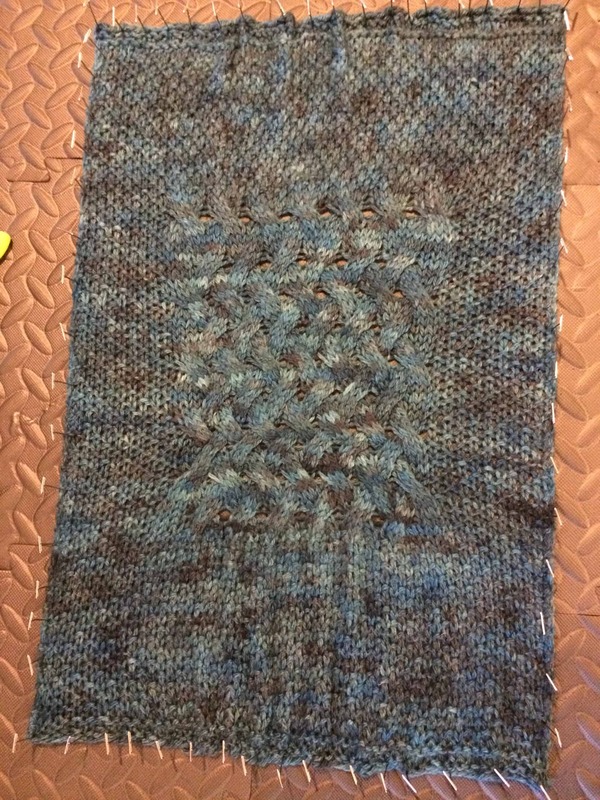 I’m just about finished weaving this project — I should finish it later today — so I thought I’d share a little bit about my experience. Short story: I loved them! When I took the weaving class in September, the teacher had us use a long sheet of craft paper to separate the layers of warp. This worked well and I have used that same method on the three projects I warped myself since the class. However, I found it much more difficult at home than in the class. In class, we had a partner helping us warp. At home, I warp by myself. I have to hold on to the warp strands tight enough to keep tension, turn the handle so the warp wraps onto the warp beam, and make sure the paper is winding in straight and flat. I really need at least one, probably two, more hands to make this work properly. I decided I wanted to try using warp sticks instead since it seems to be an easier method when you are warping alone. In this post, I am laying out a broad overview of the factors I have learned to consider when attempting to achieve a certain color. None of these factors is considered in great detail. The next post will contain a list of resources which can help you flesh out the information here.. This is the first in a series of six planned posts on the process of learning to dye. I am just learning myself, and thought it might be helpful to share the information I’ve found along the way. Unless you are a regular reader of this blog, you are probably reading this post because you already know that you want to learn to dye and have your own reason for doing so. I still thought it would be helpful to begin at the beginning with the reasons to dye because the reason you want to learn affects the choices you make in terms of which methods of dyeing you learn first, the types of equipment and dyes that you purchase, and the detail of your recordkeeping as you learn. The list I have written here is a compilation of reasons I’ve heard for learning to dye and are, in greater or lesser degree, the reasons I am personally learning. I’m sure the list is incomplete!